Dave Chappelle is an American stand-up comedian, actor, and producer. Throughout his career, Chappelle has had multi-million dollar deals with TV Channels for performing his comedy acts; acted/starred in various films, and made a lot of money. As of 2019, Dave Chappelle’s net worth is estimated to be $42 million; which makes him one of the richest comedians in the world. Dave Chappelle was born on the 24th August, 1973, in Washington D.C, and has two older siblings. He grew up in Silver Springs, Maryland, and both of his parents were professors at Universities. As a child, Chappelle attended Woodlin Elementary School, and when his parents split up, he’d spend the majority of his time with his mother in Washington, and the summers with his father in Ohio. Dave studied Theatre Arts at the Duke Ellington School of the Arts in Washington, and graduated in 1991. By this time, he had already pretty much decided that he was going to be a comedian, and he’d known for a while that he wanted to be a performer. Dave Chappelle moved to New York City in order to pursue a full time career as a comedian. He first performed at the Apollo Theatre in front of the ‘Amateur Night’ audience, but was booed off the stage. However, he got back at it, and continued to perform for audiences around New York. Chappelle was only 19 years old when he made his first film debut in Robin Hood: Men In Tights. In 2003, ‘Chappelle’s Show’ was born on Comedy Central. The sketch comedy show was so popular, that Comedy Central offered Chappelle a $55 million contract to continue the show for two years. Two years later, Chappelle walked away from Comedy Central and turned down a new $50 million dollar contract from them in the process. Aside from his wildly successful comedy acts and sketches, Chappelle has featured in many more films since his debut in the industry at 19. You can check out some of those films below in the highlights section. As of 2019, Dave Chappelle’s net worth is $42 million, making him one of the richest comedians in the world. Dave Chappelle is one of the richest comedians in the world, and that’s even after turning down a $50 million dollar deal at one point in time. As of 2019, Dave Chappelle’s net worth is estimated to be $42 million. 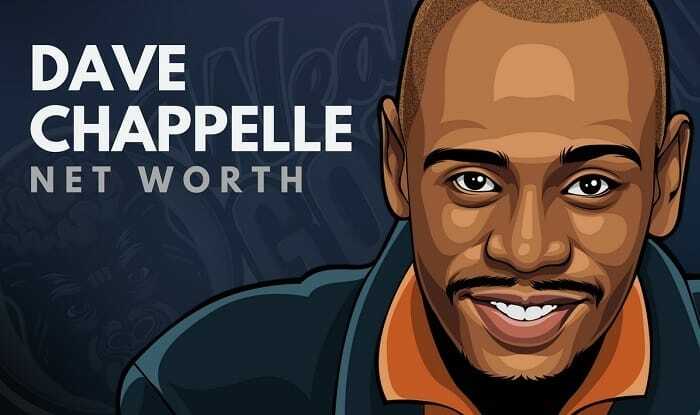 What do you think about Dave Chappelle’s net worth? Leave a comment below.